Right wing would-be dictator appears to be rising to power. This will likely be the death of the existing democracy and the rise of another authoritarian Kleptocracy. 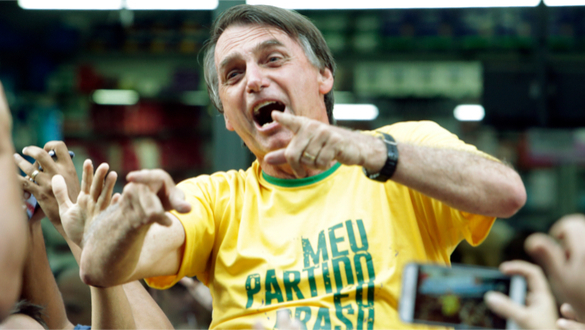 Jair Bolsonaro, the Brazilian populist candidate with far-right leanings has been compared to Rodrigo Duterte from the Philippines and the current President of the United States, Donald Trump. Bolsonaro nearly won the presidential election in Brazil, the fourth-largest democracy in the world, outright but fell short with 46% of the vote in the first round of voting, just short of the 50% needed to win outright. His closest rival only managed to get 29% of the vote. Analysts interpreted the result as a sign that Brazilians are tired of politics as usual. What made the result astounding is the values advocated by Bolsonaro, formerly an army captain, who has repeatedly made racist, homophobic and misogynist comments. The populist is supported by the rich, white elites of Brazil. He has also promised to take a hardline approach to fight corruption and crime, while at the same time expressing admiration for the country’s brutal military dictatorship under which hundreds were killed and thousands tortured between 1964 and 1985. The comparisons to Duterte are a result of the way he often talks about empowering law enforcement to kill criminals outright. He has also promised citizens that he would make it easier for them to own firearms. It was always expected that Bolsonaro would win, but analysts were surprised he got so close in the first round, especially considering how much support he managed to gather outside the traditional parties of Brazil. When he was stabbed while at a campaign rally recently, his popularity only rose further. Many citizens, however, consider his views monstrous, and tens of thousands of people rallied in the streets using the hashtag #EleNāo, or #NotHim. They warn of how Bolsonaro’s victory could have a negative effect on the country’s minorities, women and democratic institutions. Bolsonaro will next be competing against Fernando Haddad, the leftist Workers’ Party candidate. This election is likely to polarize Brazil even further. The director of Latin American Studies at Johns Hopkins University, Monica de Bolle, predicts that the next few weeks will be crazy and the divisions in the country are likely to get worse. She added that the campaign is likely to turn ugly with the parties smearing each other. Bolsonaro has however managed to turn a small party into a strong congressional force in a relatively short time with an abundance of tough talk and what will likely turn into broken promises of quick fixes of the nation’s problems. Critics point out that Bolsonaro rise to power will likely mean the end of the existing Brazilian democracy and the beginning of another dark authoritarian period in Brazil.